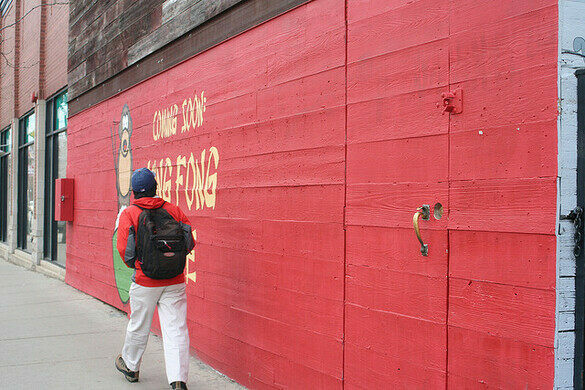 Due east of the former location of Idful recording studio, one spies an unusual facade on Damen: a wall of rough-hewn planks, covered with a changing array of murals and “Street art”. This is the Violet Hour, which in 2007 introduced speakeasy style and the nascent “cocktail culture” to this hard-drinking town. A smashing success, the Violet Hour’s exquisite high-end cocktails were designed by acclaimed NYC mixologist Toby Maloney, and its employees have gone on to open numerous posh establishments throughout the city. The Violet Hour is a recipient of the 2015 James Beard award for outstanding bar program. The lack of clear signage is a Violet Hour trademark, as is the long line to get in at most times. Their $13 sippers provide an excellent tonic with which to mull over the changing nature of urban spaces. A long lost multi-cultural music venue used to reside in the bottom floor of Chicago's Flat Iron Building.